When Donald Trump’s Thursday began, things were already horrible for him. Robert Mueller’s team was exposing that Trump and William Barr were lying about the Mueller report. House Democrats were serving subpoenas in his security clearance scandal, formally seeking his tax returns, and voting to subpoena the Mueller report. As awful as that was for Trump, by the time Thursday ended, things had managed to get far worse for him. 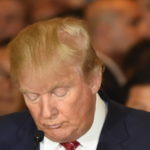 What could be worse for Donald Trump than the news that House Democrats are seeking his financial records, so they can expose his financial crimes and his illicit ties to foreign governments? On Thursday afternoon it was revealed that for the past four weeks, Capital One has been secretly cooperating with House Democrats when it comes to Trump’s financial records. It’s impossible for Trump to play defense on these kinds of things when the other side has that big of a head start. In fact, by Thursday night, the bad news was piling up so heavily for Donald Trump, the only way it could have gotten worse was if Michael Cohen announced that he’d just found an old hard drive with fourteen million items on it that may incriminate Trump. So sure enough, that’s when Michael announced that he had indeed just found an old hard drive with fourteen million items on it that may incriminate Trump. Trump always has his countermoves. He installed William Barr, and it bought him a little time with the Mueller report. He’ll try to make a countermove to block his tax returns from being seized. He’ll try to do something to belatedly undo what Capital One has been doing to him. But the point is that Donald Trump’s parlor tricks only tend to work when he’s trying to kick one scandal down the road at a time. Now he’s dealing with a cascading number of scandals, all of them major, many of them involving serious criminal liability, all of them getting worse by the hour, and all happening at once. At the rate this is going, by the time today is over, Trump will be fending off even more probes and scandals. No one survives this kind of onslaught – not even someone as slippery as Trump. Even John Gotti, the original Teflon Don, ended up going to prison. When a guy is this guilty, and he’s being this aggressively pursued from this many angles, there are only so many countermoves he can make before it catches up to him.